Windows Phone does not yet have a comprehensive Imgur client, so I thought about developing one, that will provide a great user experience when it comes to browsing and sharing images through the service. This article series documents the development process from A to Z, showing how to use the API and how to represent the returned data in an efficient way in the application itself. There is a way to do this for commercial applications through a paid endpoint, which I am not going to focus on in this series. Once you register the application, you will have two values in your hands - the client ID and the client secret. The interesting part is that even if your applications accesses public data, such as the images from the main gallery, it still needs to send the authorization header with the client ID, in order to ensure that each application is respecting it's API rate limits. This is more than enough for a simple application, and there is a way to keep track of how much your app has left from the quota, which I will be discussing in one of the next articles. 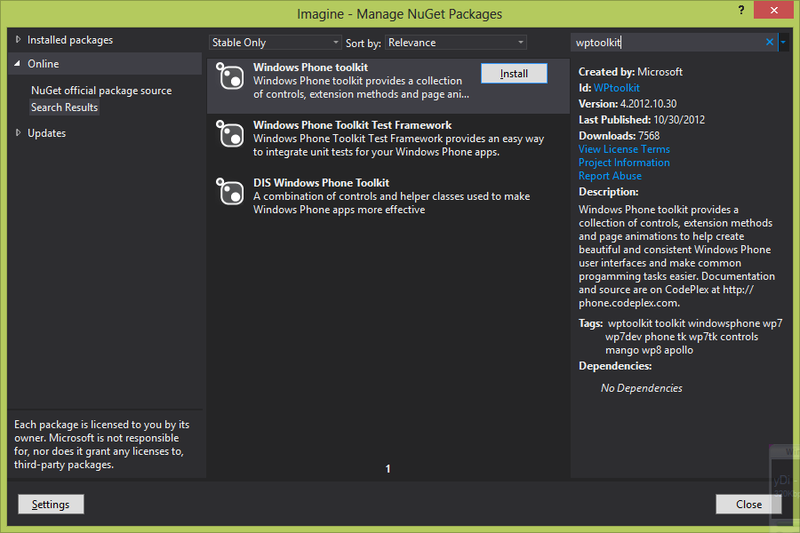 Open Visual Studio and create a new Windows Phone application. We will start with a 7.1 app, and will later extend it with capabilities from 8.0, so make sure you select the correct target operating system. 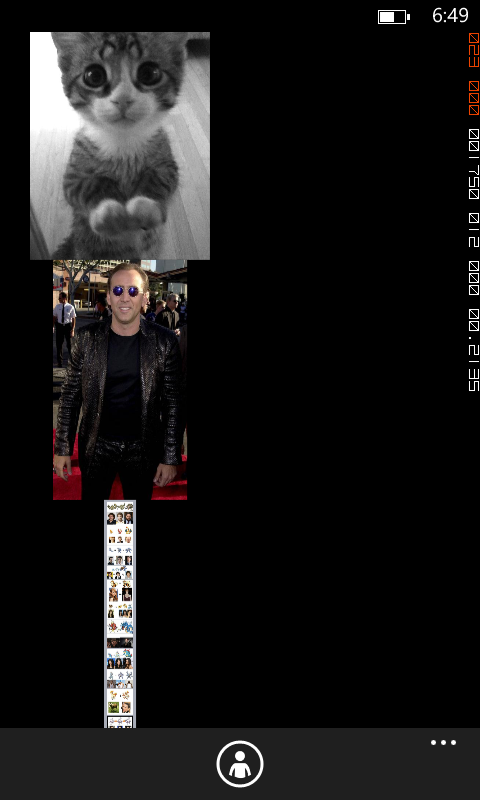 First and foremost, we need to create the code core - the Imgur service client. To do this, I created a new folder in my solution called ImgurAPI. 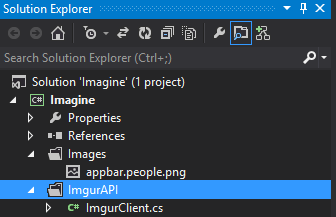 Inside it, I create a class named ImgurClient - this will be the central connection point for any requests ran against the Imgur API. This way, a single instance can be used for the entire application. Now let's look at how we can get images from the main gallery. The main gallery is the public image repository. 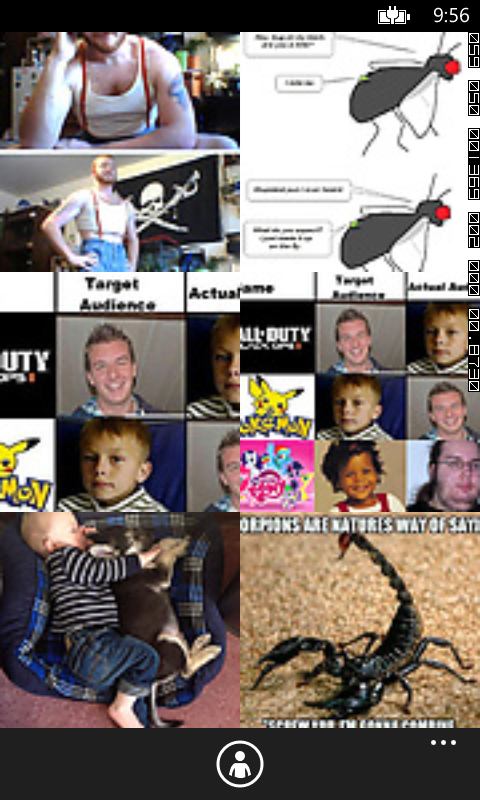 When users upload a public image, it is being placed in the main gallery. You can sort images by the time added and by how popular those are, so what you see by default is the top stack. There are a few things to mention here. You probably noticed that in the official description, some of the data types for properties such as DateTime are marked as integers. What the documentation doesn't tell you is what kind of integer is necessary. For example, for DateTime, a standard integer (Int32) would not suffice and you need to use Int64 (long) instead. Not doing so will result in an overflow exception. Also some of the properties are marked with a JsonProperty attribute. I am using Json.NET for JSON data handling and deserialization. 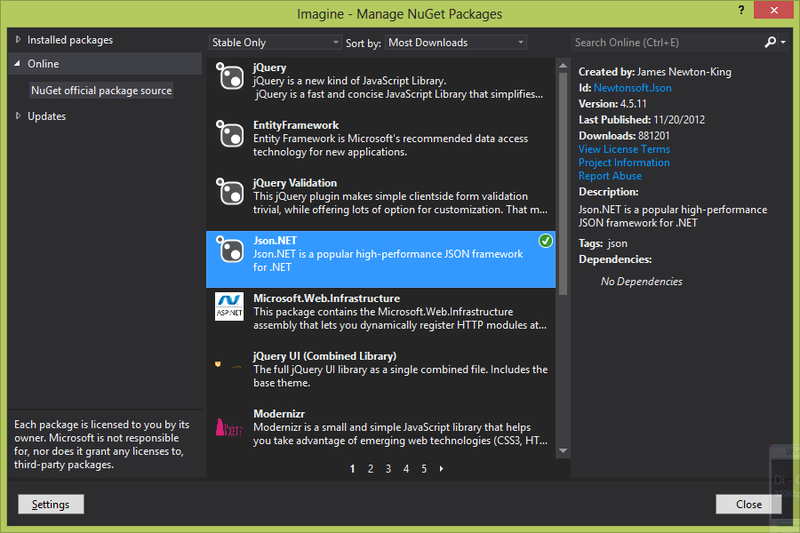 Add it to the project by right clicking on References in Solution Explorer and selecting Manage NuGet Packages. By default, the JSON deserializer will associate each property with a field that has the same name in the JSON string. Having is_album as a C# property is not something commonly used, so that's where I can include an attribute that will override the default link between the field and property names. Let's implement a function in the ImgurClient class that will retrieve the JSON data and will return it to the invoker. /// Get the images from the main gallery. /// This call DOES NOT require authentcation. As I mentioned previously, even for public data I need to set an authorization header that will tell Imgur what application is trying to aggregate data from the catalog. The main gallery endpoint is obtained from a static ImgurEndpoints class. When I am deserializing the data, I am getting an ImgurImageData object instead of a generic list. You might ask - why is that? Take a look at the result that you are getting (raw). 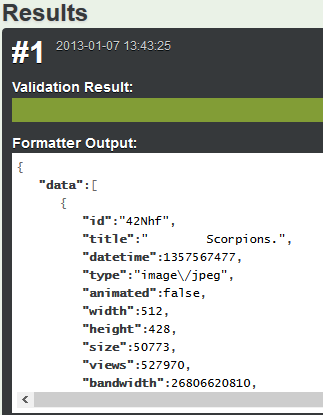 A great tool to format JSON is JSON Formatter & Validator. It's looking good so far, but I want to actually display the images somewhere in the application, and not just visualize their models in Visual Studio. 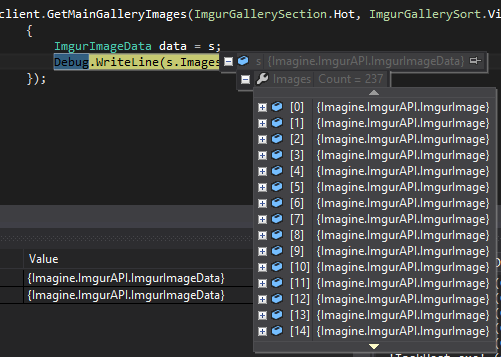 To do this, I am actually going to move the ImgurClient instance to App.xaml.cs. The data has to be inserted somewhere, obviously, so that's why I created a ViewModels folder in my solution, with a MainPageViewModel class inside it - this will be used to bind all data that needs to be handled on the main application page, and the images from the main gallery are a part of that. This is a view model implementation I talked about here. Since there is more than one view in the application, it makes sense to have the view models separated - that way as a developer you won't have much problems debugging possible data misplacement and errors. Now we can do something with the underlying Images collection. In MainPage.xaml, add a new ListBox. For testing purposes, we can make it as simple as possible, with an image as the default ItemTemplate. Why is this happening? Because by default, the returned JSON will get 200+ image references. Keeping separate ImgurImage instances is not a problem, however when all 200+ images are being downloaded at the same time in Image controls (remember that you are referencing the URL as the source), this will cause an application crash. /// Downloads images one-by-one from a given collection. I am doing the cross-check to ensure that the item that I will try to download exists and that the index is in the valid range. To avoid downloading large images and blocking memory, I am downloading thumbnails instead, which can be obtained by appending a lowercase 's' to the image ID in the URL (you can see how I am forming the URL above). By default, the Image control does not support GIF images, so I am making sure that I am not downloading unnecessary stuff either. I will show you how to mitigate this issue later in the series. Here is a problem, though - once the download is complete, the ImgurImageData instance is gone, and so is the entire deserialized collection of JSON objects. To avoid this, I am going to create another List<ImgurImage> in my main page view model, specifically for storing the serialized items. I can use a List because I am not binding it and I do not need to have an implementation of INotifyCollectionChanged. In the next article of the series, I will be talking about making the ListBox scrollable, loading images as we go, and viewing details about each of the images that is being loaded.